Founded in 1977 on the strength of an old family chocolate chip cookie recipe, Great American Cookies has set the standard for gourmet cookie sales in a fun, celebratory environment. For more than 30 years, we have maintained the heritage and integrity of our products by producing proprietary cookie dough exclusively from our plant in Atlanta. Known for our signature Cookie Cakes, trademark flavors and menu of delectable products baked fresh in store, at Great American Cookies we Share the Fun of Cookies with each treat we make. 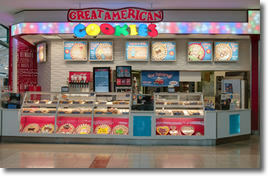 Home of the Original Cookie Cake, Great American Cookies is a dynamic, mature and growing brand. With more than 30 years as a leader in the cookie and snack food industry, Great American Cookies offers superior brand recognition and a tried and true business model for franchisees to build from. We understand the importance of being where the consumers are, which is why customers can now place online orders for Cookie Cakes, a quick and easy option that creates an added revenue source for the franchisee. Ranked top of category in Entrepreneur Magazine's "Top 500 Franchises"
Large network of experienced franchise owners and a strong franchisee association for added support, guidance and advice in building business. National press features such as Food Network's Unwrapped, Fox & Friends, the CBS Early Show, and effective social media campaigns driven by our marketing team and a top public relations firm. A: We are proud to participate in the VetFran Program and find that military veterans make excellent franchisees. We encourage those individuals to consider becoming a part of our system by offering a 25% Great American Patriot Program discount off the first store franchise fee. A:The size ranges between 500 and 900 square feet. We also have a kiosk program to expand your store's reach. Kiosks average 250 square feet. We find that areas such as regional malls, lifestyle centers, entertainment complexes, airports and transit stations make excellent sites. Q: Can I own more than one Great American Cookies location? A:Absolutely! The low start-up costs and simple operation make it easy to own multiple Great American Cookies stores. A large number of our locations are owned by multi-unit operators, and we highly encourage Area Development. We have found a few comparable characteristics among our most successful franchisees: a committed, positive attitude; willing to work for success, participate in on-going training and attend brand meetings; passionate about community and building the business. If this describes you, and you meet our minimum of $100K in liquid capital, then you are the ideal candidate for Great American Cookies franchise ownership. Great American Cookies is currently accepting inquiries from the following states: Wyoming, West Virginia, Wisconsin, Vermont, Utah, Texas, Tennessee, South Dakota, South Carolina, Rhode Island, Pennsylvania, Oregon, Oklahoma, Ohio, New York, Nevada, New Mexico, New Jersey, New Hampshire, Nebraska, North Dakota, North Carolina, Montana, Mississippi, Missouri, Minnesota, Michigan, Maine, Massachusetts, Louisiana, Kentucky, Kansas, Indiana, Illinois, Idaho, Iowa, Florida, Delaware, Washington, D.C., Connecticut, Colorado, Arizona, Arkansas, Alabama, Alaska. @DirtyMoose7980 Thanks for the love! Feel better! @katandgibs Hey there, mind sending us a direct message so we can learn more? Thanks! @runnerchick78 We think it's a GREAT thing! @macy_angelle Travesty. Is it possible to change this? Like...today? @CorneshaNicole_ Time to change that! RT @_kasiii: Great American Cookies got the best sugar cookies 襤. @macy_angelle Did you get some?! @Nvayyme_ Hope you got some!